that you stay awake and alert while driving” (1). Basically if a truck is over 10,000 pounds and hauling commercial loads interstate, it is subject to the Unites States Department of Transportation rules and regulations. If a truck only operates within one state, it is considered intrastate and does not need to comply with federal government regulations. However, most car shipments do cross state lines and therefore the truck driver is subject to interstate rules. What Are The Basic Hours of Service Guideline Limits? “This limit is usually thought of as a “daily” limit even though it is not based on a 24-hour period. You are allowed a period of 14 consecutive hours of duty time after being off duty for 10 or more consecutive hours. The 14-consecutive-hour duty period begins when you start any kind of work. Once you have reached the end of this 14-consecutive-hour period, you cannot drive again until you have been off duty for another 10 consecutive hours. Your driving is limited to the 14-consecutive-hour duty period even if you take some off-duty time, such as a lunch break or a nap, during those 14 hours. This regulation is found in Section 395.3(a)(2). “During the 14-consecutive-hour duty period explained above, you are only allowed to drive your truck for up to 11 total hours. There is no limit on how many of those hours you are allowed to drive at one time — you may drive for as little as a few minutes or as much as 11 hours in a row. Once you have driven a total of 11 hours, you have reached the driving limit and must be off duty for another 10 consec­utive hours before driving your truck again. This regulation is found in Section 395.3(a)(1). “In addition to the first two limits, which are explained above, is the 60/70-hour limit. This limit is based on a 7-day or 8-day period, starting at the time specified by your motor carrier for the start of a 24-hour period. This limit is sometimes thought of as a “weekly” limit. However, this limit is not based on a “set” week, such as Sunday through Saturday. The limit is based on a “rolling” or “floating” 7-day or 8-day period. The oldest day’s hours drop off at the end of each day when you calculate the total on-duty time for the past 7 or 8 days. For example, if you operate on a 70-hour/8-day schedule, the current day would be the newest day of your 8-day period and the hours you worked nine days ago would drop out of the calculation. • If your company does not operate vehicles every day of the week, you are not allowed to drive after you’ve been on duty 60 hours during any 7 consecutive days. Once you reach the 60-hour limit, you will not be able to drive again until you have dropped below 60 hours for a 7-consecutive-day period. You may do other work, but you cannot do any more driving until you are off duty enough days to get below the limit. Any other hours you work, whether they are for a motor carrier or someone else, must be added to the total. • If your company does operate vehicles every day of the week, your employer may assign you to the 70-hour/8-day schedule. This means that you are not allowed to drive after you’ve been on duty 70 hours in any 8 consecutive days. Once you reach the 70-hour limit, you will not be able to drive again until you have dropped below 70 hours for an 8­consecutive day period. You may do other work, but you cannot do any more driving until you get below the limit. 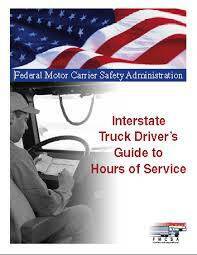 Any other hours you work, whether they are for a motor carrier or someone else, must be added to the total. The regulations allow you to “restart” your 60 or 70-hour clock calculations after having at least 34 consecutive hours off duty. In other words, after you have taken at least 34 hours off duty in a row, you have the full 60 or 70 hours available again. You would then begin counting hours on the day of the restart and not go back the full 7 or 8 days. This regulation is found in Section 395.3(b) and (c). The FMCSA has tried with their 3 basic rules to protect truck drivers from themselves. Time is money and auto transport truck drivers are by nature hard working people who will push themselves to make a buck to feed their families. It is extremely grueling and hard work that they are doing. Don’t think so? Try driving your cushy sedan 500 miles in a day and you will be stiff when done, your back sore and your brain weary. Sleep it off and get up and do it again. And again. Don’t stop there, gotta get to Baltimore, so do it yet again. Brothers and sisters it’s hard. So the FMCSA set rules that protects auto transport truck drivers from themselves and maybe the bosses who otherwise might push them too far. 1. Be punctual even if the driver is not. He has several customers to meet and any one of them may throw his schedule off by showing up late or unprepared, i.e. failing to have cash or money order to pay the balance. The driver will really appreciate your understanding of the pressures on his time. And he does feel bad if you are inconvenienced. 2. Smile and be kind please. That auto transport driver just performed a service for you and chances are he or she just had a rougher day than you. Honey works better than vinegar. A smile goes a long way. 3. Of course he or she is being paid for a service, but would it kill you to say thank you. There is dignity in work and when somebody does a job, it’s not all about the money. It is also respect for a job well done. Saying thank you is really appreciated. 4. You know, a waiter or waitress gets tipped for hustling tables and providing good service, and they deserve it. Don’t you think that a auto transport driver who just took good care of your car for several hundred miles, maybe thousands, deserves a little extra too? You don’t have to do that, but c’mon buddy, be cool about it and show a little extra green. It’s good Kharma and what goes around, comes around.